Jeremy Ashcraft on a Pacer Carbon. Altius - Altius poles. Based in Jacksonville, TX. ESSX - ESSX poles. Based in Ft. Worth, TX. Gill Athletics - Pacer FX, Mystic, Carbon FX, and Skypoles. Based in Champaign, IL. Nordic Sport - Nordic poles. Based in Sweden. On Track - Big Stick poles. Based in Burbank, CA. Port a Pit - Catapoles. Based in Ft. Worth, TX. UCS - Spirit Poles. Based in Carson City, NV. The sign in front of Elite Athletics. The pit used in the 1996 Olympics, now at Lindenwood University. Made by Port a Pit. AAE - AAE Pits. Based in Royersford, PA.
Buck Terrell Athletics - Buck Terrell pits. Based in Houston, TX. Dima Sport - Based in France. Elite Athletics - Elite pits. Based in Corsicana, TX. Gill Athletics - Pacer pits. Based in Champaign, IL. Glentham Sporting Products - Glentham Landing Pits. Based in Australia. Idaho Sewing for Sports - Based in Grangeville, ID. Lisco Sports - Lisco pits. Based in Lubbock, TX. Marty Sports - Based in France. Port a Pit - Port a pits. Based in Ft. Worth, TX. UCS - UCS pits. Based in Carson City, NV. VS Athletics - Springco pits. Based in Torrance, CA. Nordic Pole used at the WA State Track Meet. Chris Steddum of South Carolina on a UCS Spirit pole. 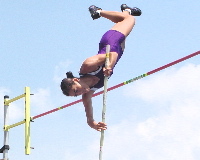 Jessica Doyle of Lone Star Pole Vault Club. ESSX pole, pit made by Elite Athletics. Advantage Athletics - Gill poles. Based in Woodland Hills, CA. Arkansas Vault Club - Altius poles and Elite pits. Based in Norman, AR. Atafa Sporting Goods - Catapole. Based in Needham, MA. Bell Athletics - Gill and ESSX poles. Based in Jonesboro, AR. First to the Finish - Gill poles. Based in Carlinville, IL. 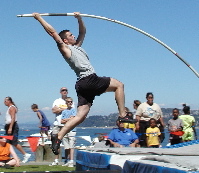 Flight Deck Athletics - Gill poles. They also have poles for rent. Based in Minnesota. HIP Athletics - Gill poles. Also have a pole exchange program. Based in New Jersey. Jump Start Athletics - Gill and UCS poles. Based in Edmonton, Alberta, Canada. Lone Star Athletic Equipment - Gill and ESSX poles and Elite pits. Also have a pole exchange program. Based in San Marcos, TX. Marty Sports - Nordic Poles. Based in France. MF Athletic - ESSX, Gill, Nordic, Rocket, and UCS poles. Based in Cranston, RI. NW Pole Vault - Altius poles and Elite pits. Based in Seattle, WA. On Track - Big Stick, Gill, Nordic, UCS. Based in Burbank, CA. 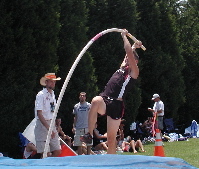 Personal Record Track & Field - Gill poles. Based in Youngtown, AZ. Pits-n-Stuff - UCS poles. Based in Mercer/Lansdale, PA.
Potter Athletics - Gill poles. Based in IN. Sky Athetics - UCS poles. Based in AZ. Stackhouse Athletic - Nordic Poles. Based in Salem, OR. Track City USA - Gill and Nordic poles. Based in Gilbert, AZ. VS Athletics - Gill poles and Springco pits. Based in Torrance, CA. Willamette Striders - Gill poles. Based in Oregon City, OR. Wolverine Sports - Gill poles. Based in Ann Arbor, MI. 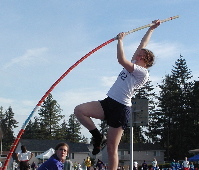 Molly Loesche of Everett High School on an Altius pole. Most of the dealers above also carry pole vault related items, so be sure to check out their sites. 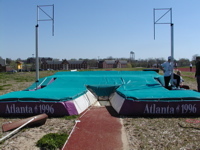 NeoVault - The coolest pole vault DVDs ever. Pocket Videos - Little flip books of vaults at various heights. 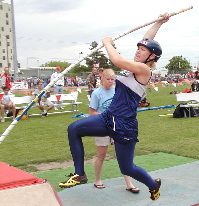 You can see pole vault club websites by searching for clubs in the Pole Vault Power Network. Got a site to add? Dead link? Let us know!